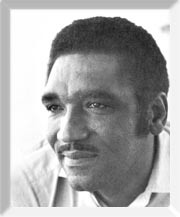 Born in Petite-Riviere de l'Artibonite, Haiti, in October, 1928. Before becoming a painter, François was a sculptor and student of Odilon Duperier. François is a houngan, and needless to say is deeply involved in Vodou in his daily life and in his art. As such, his paintings are characterized by subtle occult and mystical symbolism, as well as more obvious voudou scenes. Internationally reknowned, François' works have been exhibited in Belgium, Germany, the U.S., and France. His paintings have been on permanent exhibition in the Brussels Museum since 1963. Within the last many years, he has been seized upon by collecters, who see his versatility, use of color, and elegance of style as promises of greatness. Born in Les Cayes on September 14,1924. He moved to Port-Au-Prince in 1942 where he enlisted in the air force. Three years later, he joined the "Centre d'art" where he worked with other great masters under Dewitt Peters. He was one of the first painters to achieve recognition through the Center d' Art. In 1955 he had a one-man show at the Centre d'Art. His work is included in major collections worldwide. Poisson's paintings of this vintage and quality are rare. 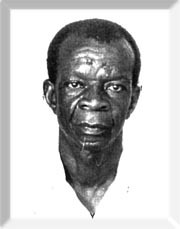 Louverture Poisson died in 1984. Jacques-Enguerrand Gourgue was born in Port-au-Prince in 1931, and died in 1996. He began painting when barely out of primary school, and quickly achieved world-renowned status. 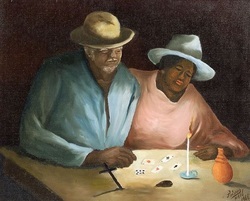 He is beyond dispute the leading figure in modern Haitian painting. At the age of 17, his work was exhibited in the Museum of Modern art in New York and his painting "The Magic Table" is still a part of the Museum's permanent collection. In 1949, at the age of 18, he won the gold medal at the exposition for the Port-au-Prince bicentennial. He painted vodou scenes, flowers, and images of rural Haitian life. In the words of Nadal and Bloncourt, in their great book La Peinture Haitienne, "Gourgue's work reflects an anguished man's sense of the tragic." Throughout most of the latter half of the twentieth century his work has been almost continously exhibited in prestigious shows in Europe, North America, and Latin America, including important sales at the New York fine art auction houses Sothebys and Christies. Gourgue's mother is said to have been a mambo, or priestess of voudou. Having had a turbulent and troubled childhood, he turned to painting and joined the Centre d'Art in 1947. He adopted his own style of painting, instantly distinguishable, featuring the Haitian mountains, skeletal trees, peasants and their huts, and vodou symbolism in an almost surrealistic manner. The paintings in our collection are each from the 1950s and 1960's, including his "Spanish Period," with a Picasso influence, and are some of the finest examples of his work now available on the market.